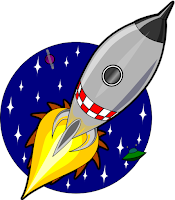 We reached 60 stars on the rocket which means tomorrow is our rocket party. Congratulations 1C! As you know this has taken effort from every single one of you, so well done! 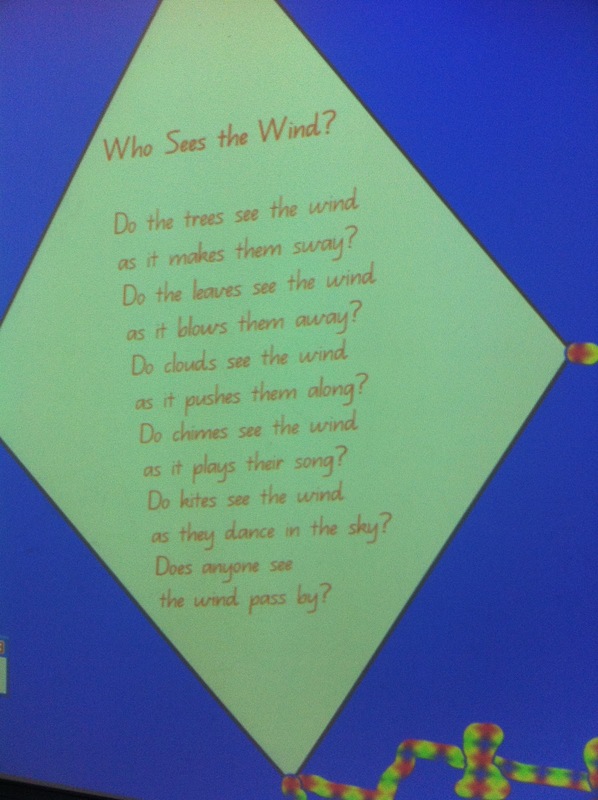 We recently read a poem called "Who sees the wind?". We discussed what kind of things we can see the wind do. 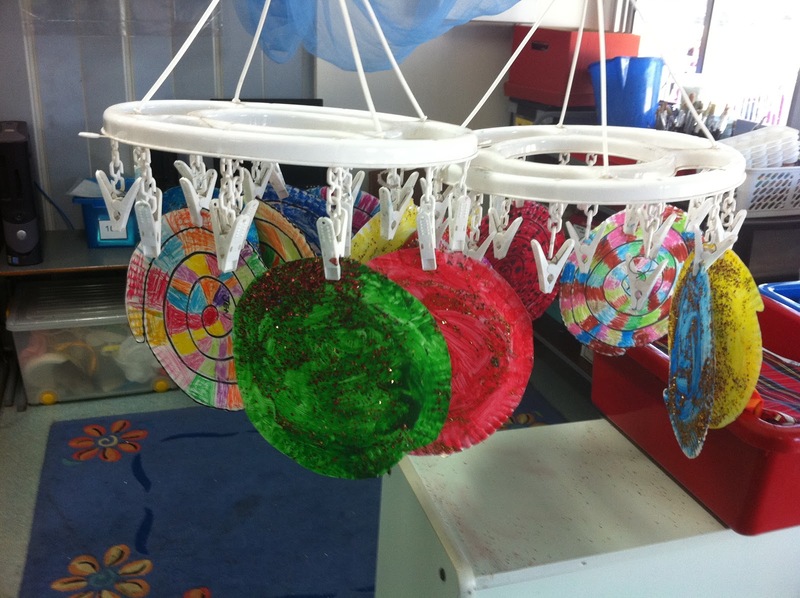 After reading our poem, we began to make wind catchers for our classroom. 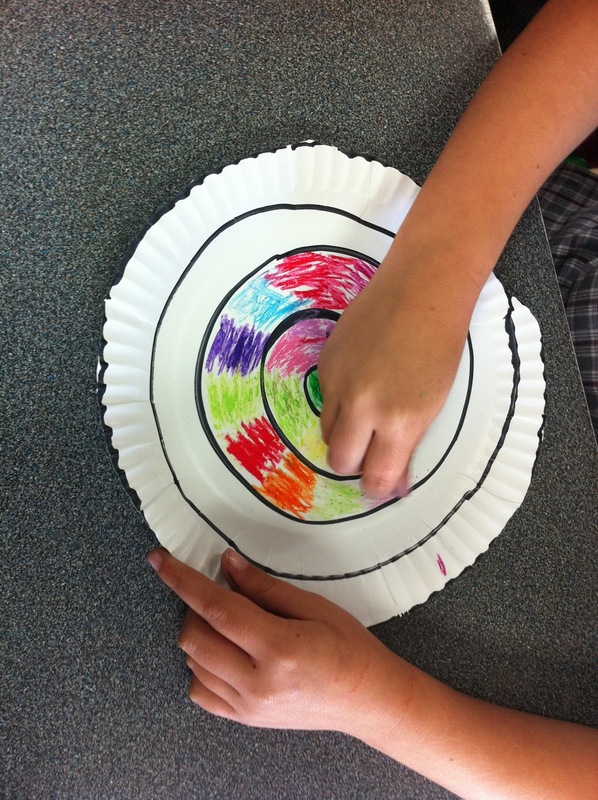 For this activity we needed: paper plates, a felt pen, scissors, oil pastels, paint and of course glitter! 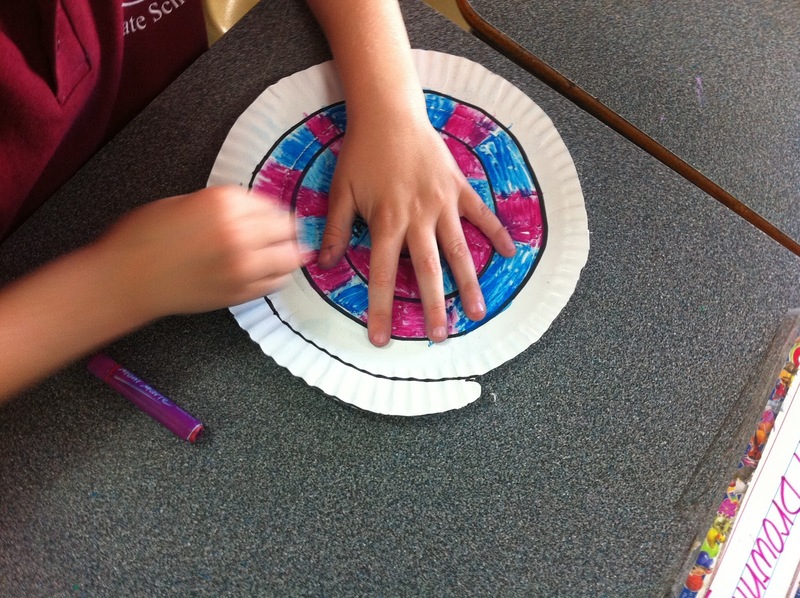 First we coloured in our paper plates using the pastels. Some of 1C chose to do patterns. 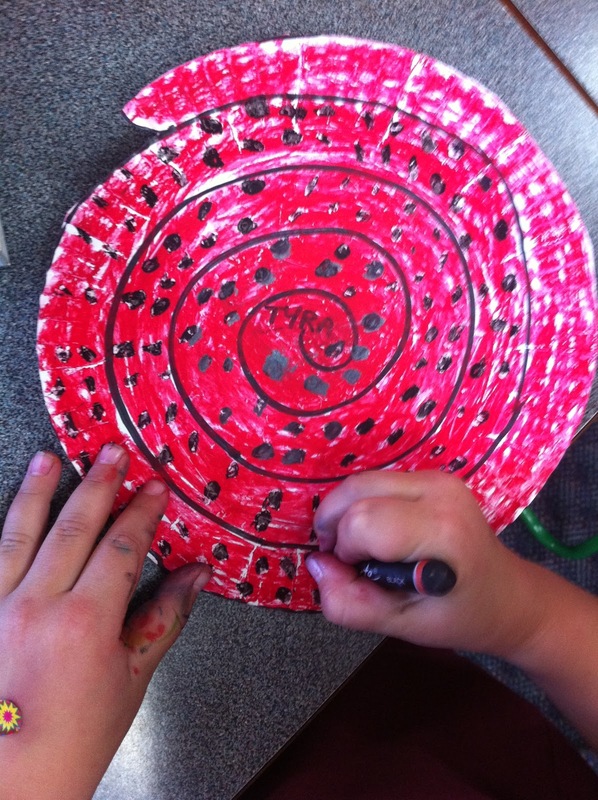 After the paper plate was covered in colour, we painted the back in one colour and then dipped them in glitter. 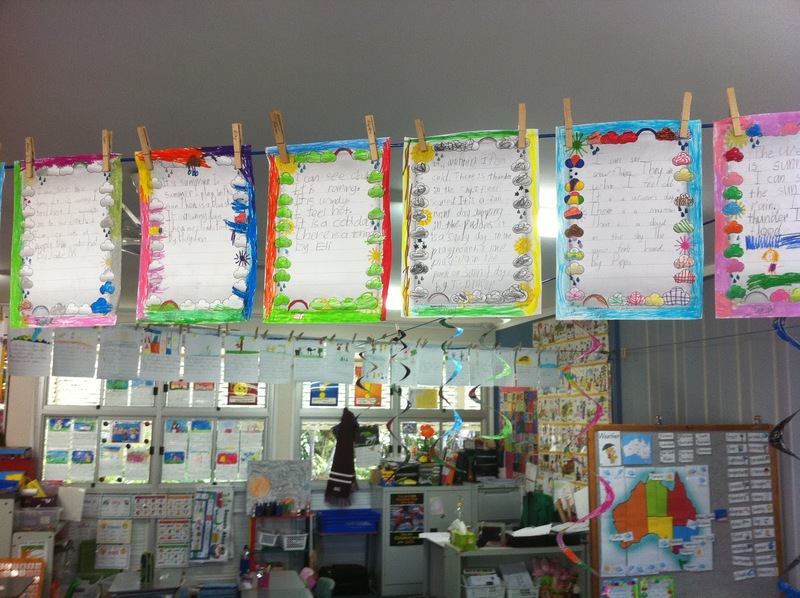 These were hung up to dry overnight. When the plates were dry, we cut along the line and hung them up. They look spectacular in our room! 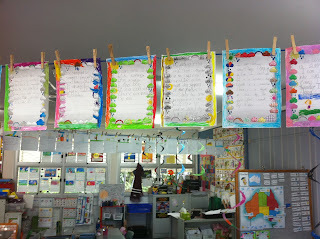 We have also added to our classroom by creating a 'weather' zone and writing weather poetry. 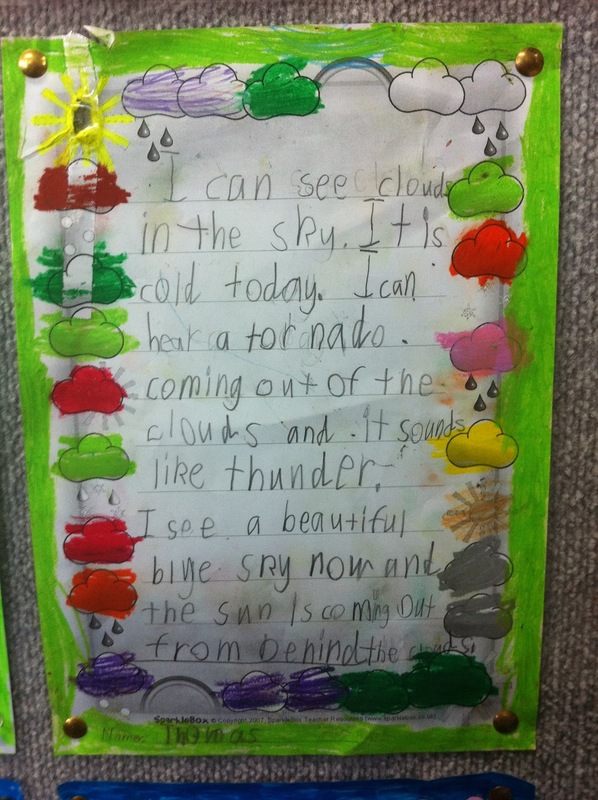 We listened to a Ten News weather report yesterday. Firstly we paused the video and talked about what we could see. 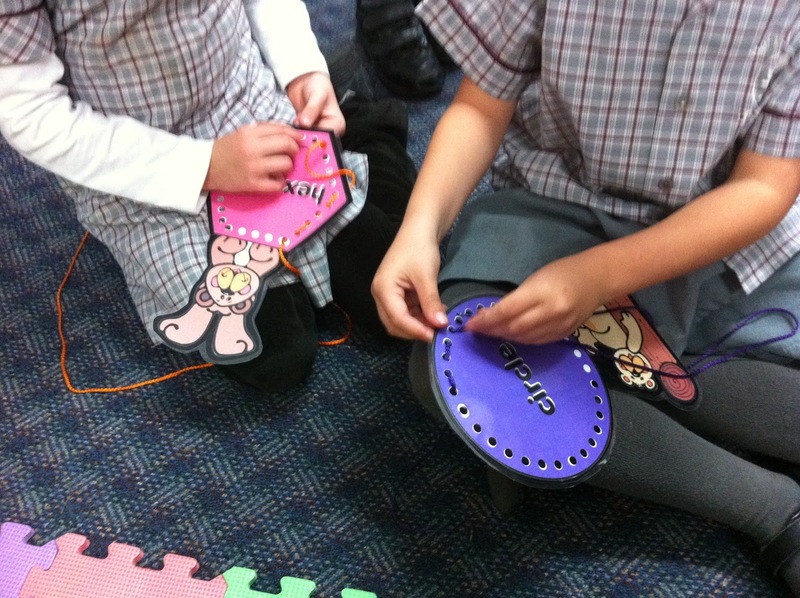 1C worked out that the orange part is a map of Australia. We talked about what the blue swirl could be. 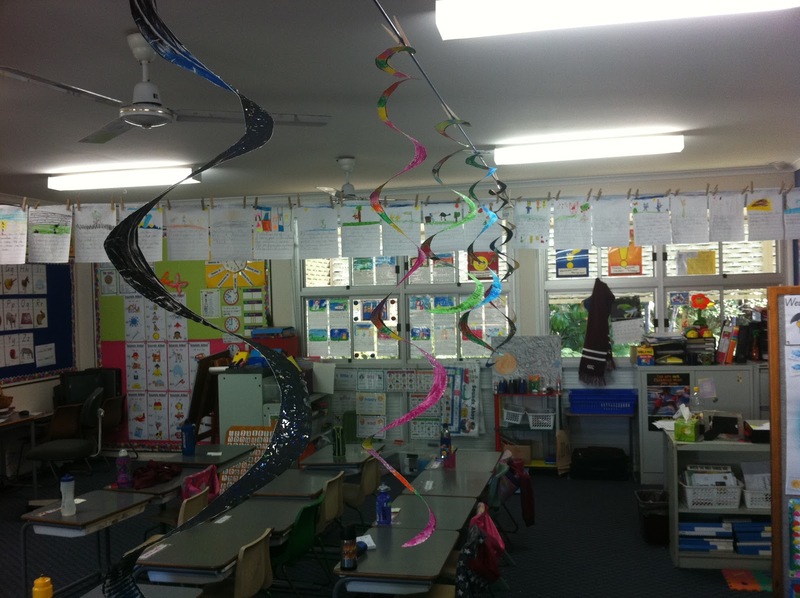 Some of 1C thought it might be a big wave, a tornado or a cyclone. After listening to some of the report, we knew that the blue swirl was Cyclone Yasi. The class talked about where we lived and we tried to work out where Bribie Island was. Some of the class came up and pointed to where they thought it might be. We discussed that we live closest to Brisbane so when we listened to more of the report, we were looking out for the word 'Brisbane'. We also listened for the words: Queensland, Cyclone and Yasi. When the reporter said the numbers next to the places, she also said the word 'degrees' after them. We now know that the numbers next to the places are how hot or cold it is going to be. We discussed that the higher the number, the hotter it is going to be. 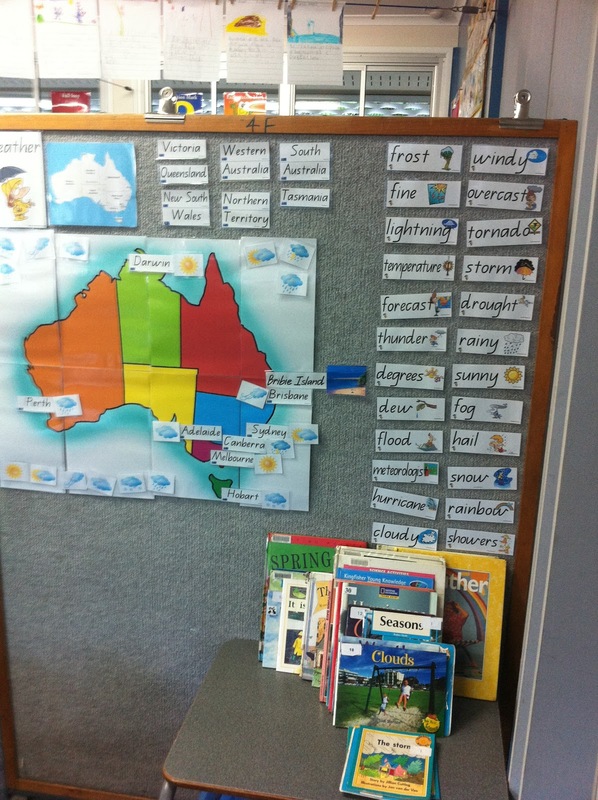 We are going to be learning all about weather throughout Term 3. This afternoon we brainstormed lots of weather words and discussed what they meant. 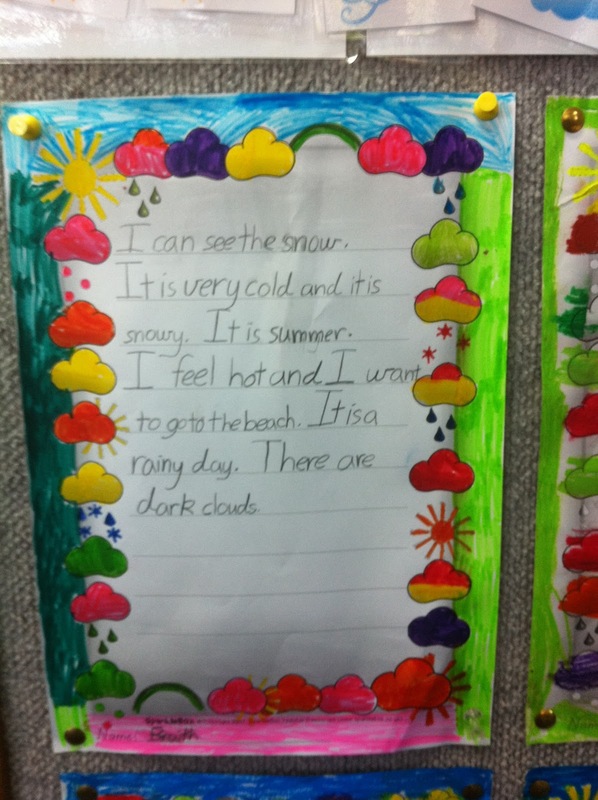 We also made a list of what we know about weather, and what we would like to know. In the coming weeks we will be looking at weather reports from newspapers. If you get the paper daily or even just on weekends, please cut out the weather section and send into class. 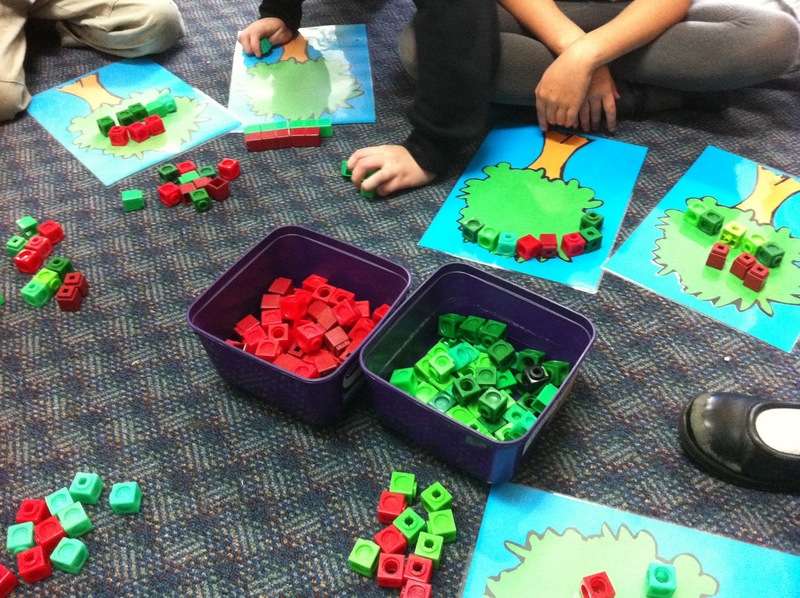 Try out these links to get started learning about weather. 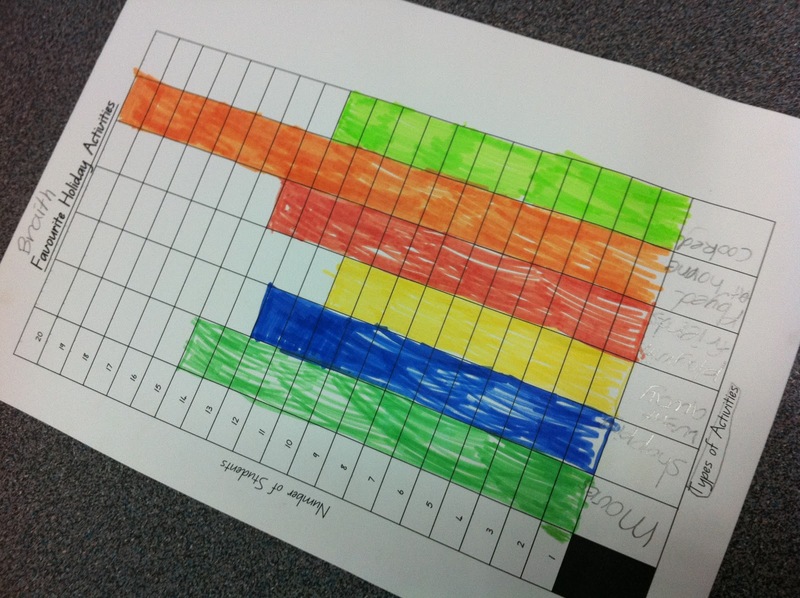 Today we made a bar graph using data from a tally board. First we brainstormed popular holiday activities. 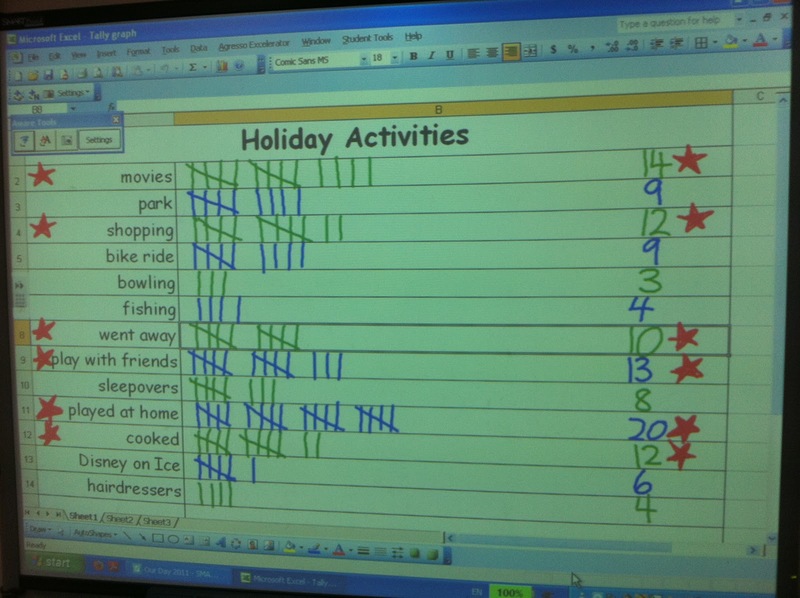 Next we went through each activity and counted how many students had done each activity during the June holidays. 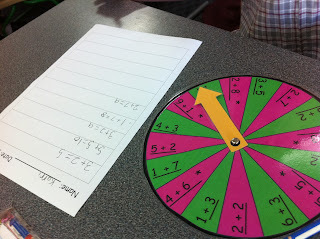 We put these results onto our tally board. After that, we each got our own blank graphing sheet to complete using the data we had collected. Tell us what your most enjoyable holiday activity was and why that is your favourite! We got straight back into our maths rotations this week. 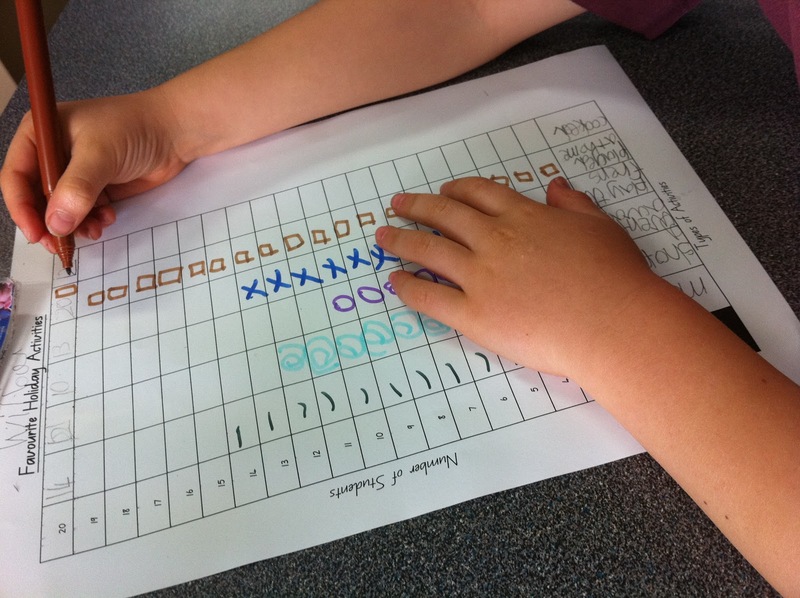 This week we have focused on addition, 2D shape names and properties, repeating patterns and creating a simple bar graph. I hope everyone had a fantastic holiday - two weeks flies when you're having fun! I can't wait to hear all about your break! Now is the perfect time to check you have everything you need for the term ahead. Please check with your child that they have lead pencils, colouring pencils, felt pens, erasers, sharpener, scissors and glue. All of these things are essential - we use them everyday! Reading groups will start next week. On another note, anyone who is available to do some laminating please let me know. I would very much appreciate it. My printer has been working overtime on printing lots of new activities and resources for our classroom! 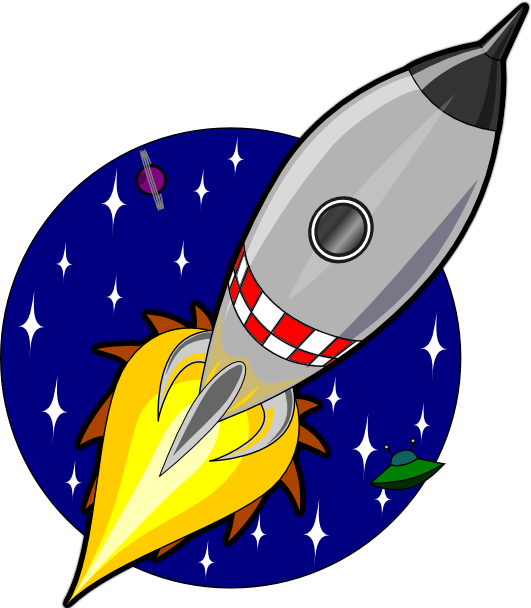 Remember: Reports go home on Thursday / Parent/Teacher interviews week 2 (feel free to book in now if you already know you want one).